It’s been such an exciting past couple of days with FNO, NYFW, and heading up north to the Brimfield Flea Market and Antique show this past weekend. I’m very behind on my posts, but have been waiting anxiously to post about meeting one of my favorite celebrities ever, Gwen Stefani. I’ve been a No Doubt fan for about 13 years, and following the l.a.m.b brand for about 5. I’ve had about 10 near misses where I was feet away from Gwen, arrived 2 minutes too late to meet her, met the boys of ND backstage but Gwen was sleeping, etc. for years, and was starting to think I’d just never meet her. Then last Thursday I met her not once, but TWICE. See more photos of the collection at Style.com. After a short wait, the incredibly adorable Rossdale family came out to a frenzy of paparazzi. I can’t imagine what it feels like trying to reach your car, and being completely mobbed. But Gwen was totally calm, even signing autographs for fans and posing for photos with Milk’s security guards. I snapped some (highly obscured) photos, and next thing I knew was right next to Gwen’s SUV. She was right in front of me, signing autographs, and I had nothing for her to sign. So I held out my arm, and had her sign my lamb cardigan. She asked if I was sure, I said yes, and the rest is history. I actually lost a lot of my lamb clothing in our house fire last February, so at first I was weary I’d made a mistake “ruining” one of my remaining pieces. But I figured I’d never see Gwen again, so I had to take advantage of the situation when it presented itself. After all the excitement, I headed downtown to grab something to eat. 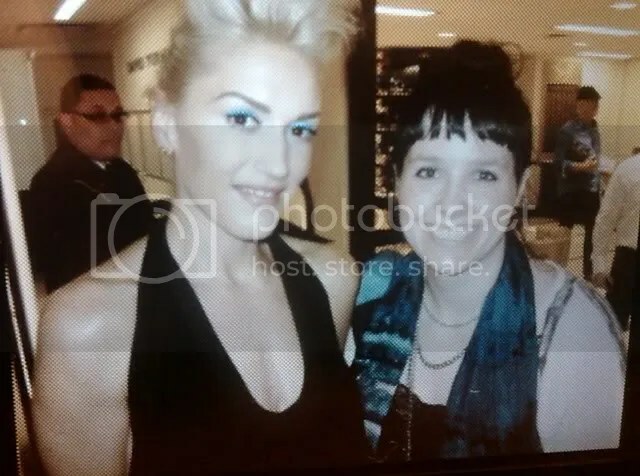 I texted another friend, Alison, who was in town shopping, and found out she was at Bloomingdales waiting in line for a meet and greet with Gwen at 7pm! She had an extra ticket (thanks to her Mom! ), and said if I could get there by 7, I could have it! I RAN to the subway station. And ran off, making it from the West Village to Bloomingdales in a record 20minutes. I got there, and was SECOND in line. While we were waiting, I was interviewed by a NYC news station. I’m not going to embarrass myself by posting the video here, and it won’t embed anyway. But I will say it was fun being on TV, even if they took something I’d said–how much money I’d spent on lamb in the past— out of context. Gwen waiting for the signing to begin. Love her hair. 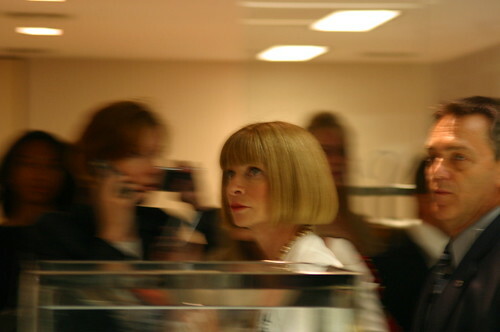 When the event started, Anna Wintour appeared! After a short wait, the line started moving and I got to meet Gwen again! I mentioned her signing my cardigan, and she laughed saying it probably looked like a marker smear. I agreed but said I was glad I did it anyway. She was really nice. I’ve met a ton of celebs and people admire, but have to say she was definitely my all time favorite. Me meeting Gwen. Photo via PopSugar. It’s shown up on LIFE.com and Getty Images as well! The meet and greet quickly ended, and we hung around waiting for Gwen to leave. Gwen finished the meet and greet not long after, and as she passed by, I stopped her and asked if I could take a photo with her! We weren’t “allowed” to take photos during the meet and greet, but she kindly obliged, and a security guard took our photo. I told her I loved her eyeliner, and she replied “and I love yours“! This is a photo of a photo, thanks to a broken mini-card reader! Security kept trying to chase the group of meet and greet attendees out due to “fire hazards” but we all hung around, knowing Gwen would soon be leaving the store. After about 5 minutes, we saw flashbulbs going off and knew she was rounding the corner! I didn’t end up making it to any other events for Fashion’s Night Out. But after the amazing night I had, I was pretty sure nothing could top this anyway. I hope the event continues every fashion week, as it was really great getting to see and meet celebrities, and shop in such a fun environment. This night was definitely worth waiting over ten years for. Please do not use these photos with out my permission. this is so awesome! i am so happy for you finally getting to meet her, she is so gracious and nice in person… i’d say you are lucky, but you definitely paid your dues waiting and hustling over to bloomingdales! so awesome! Thanks Aneta! It was sooo much fun. Everyone I know who has met Gwen has had nothing but great experiences with her! I feel like that’s rare for celebrities. hahah. I’m so glad that you finally got to meet her. She is by far one of the most down to earth celebs I have ever met. Wah! You were soooo lucky!! Thanks! It was a long time coming. haha. I freaking love her. Lucky you!! Thanks! She really was amazing. Gwen looks so glam here! Heyyyy omg ten years!! that is awesome !!! greaatt picture and cool sites!! Found you in an Agent Lover post. Wow! This story is amazing. I literally have tears in my eyes. I’ve been a fan for 13 yrs. as well, I can’t imagine meeting Gwen, I would flip out. I told some of my friends who live in NYC to check out the event that day, they said that place was a mad house. Lucky you!! Awww thanks! I almost cried after it all happened. After looking at my photos on my camera right after the event it just kind of hit me. I feel like I waited sooo long to meet Gwen! But it was worth it. I hope you can meet her someday too! I only got to meet her because a kind friend bought merchandise and let me get in line with her, instead of her mother. One of the nicest things anyone’s ever done for me!